La Joya ISD’s head fine arts administrator, Jose Ruben Adame, was named the 2018 Texas Outstanding Music Educator of the Year. Since 1920, the National Federation of State High School Association (NFHS) award this honor as it has led the development of education-based interscholastic sports and activities that help students succeed. One nominee per state is accepted for this award and must be endorsed by the state association office. The criteria consists of: an evaluation by their organization, continuance of an activity program, significant and ongoing contributions to the fine arts, years of both curricular and co-curricular service, and contributions to the fine arts; both in and out of state. Dr. Bradley Kent, UIL Executive Director, nominated Adame to represent the state of Texas. Once all state representatives submit the nominations, nominees are evaluated by a national committee who ultimately determine an honoree. Kent recognized Adame for obtaining the award during the last evening of this year’s UIL State Mariachi Festival. “I’m overwhelmed, excited, and very humbled. When I first received notification of the award, what came to mind was all the people that have been involved with me and have helped me along the way — my staff, students and family. 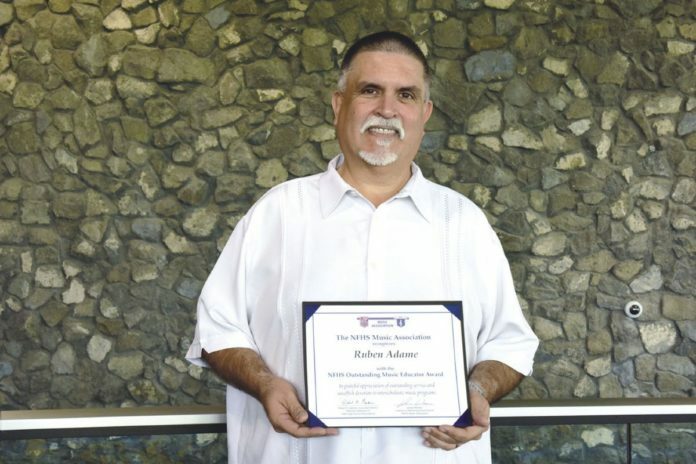 The honor is shared with many – It takes a village, and this award certainly embraces that,” Adame said. Adame has been with La Joya ISD for over 26 years in various roles such as assistant band director, head band director for La Joya High School, and currently head fine arts administrator for the district. Aside from his position at La Joya ISD, he is the executive secretary for UIL for Region 15, which comprises all music programs from the city of Roma to Alamo. Additionally, Adame is on the State Committee for the UIL State Mariachi Festival. “I’m always busy, but I love what I do. I just love serving people. I love helping kids. There’s nothing more rewarding than seeing a student smile because of what they’ve just performed. It’s better than any trophy or award anybody could ever get,” Adame said.